Key ingredients: Flour, sugar, butter,baking powder, and other ingredients. The use of green fillers in the arrangement depends upon their availability and also on the season. The cake and chocolates are of good quality. 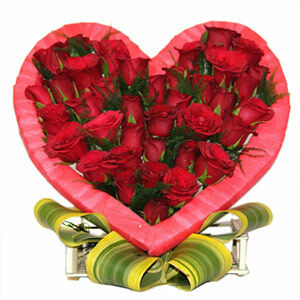 Roses are the most commonly used flowers worldwide. First biggest rose was 33 inches high. 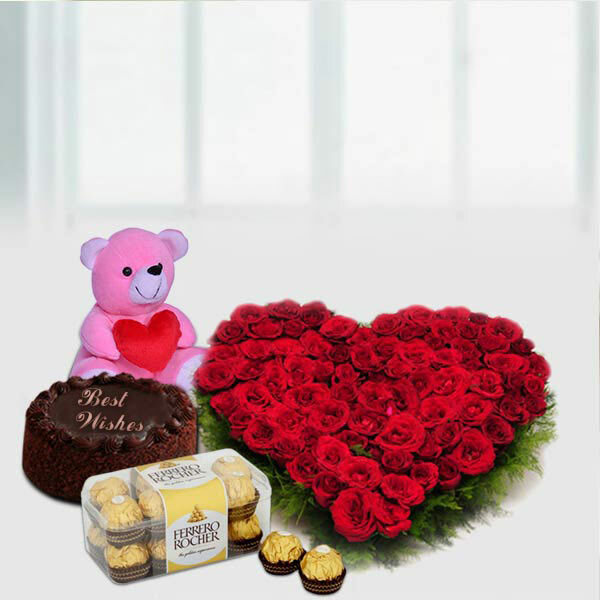 This time surprise your sweetheart or someone very special to you with this big and cheerful hamper of Love Surprises which has a lot to offer. 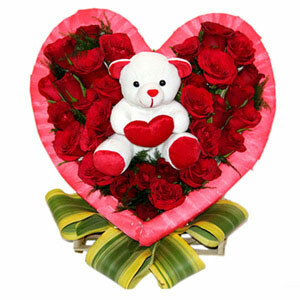 It comprises of one Heart Shape Flowers arrangement of 50 Red Roses, one delectable Chocolate Cake of 500gm, one cute 6 inch teddy and one pack of 16 Ferrero Rocher Chocolates of 200 gm.